Clinique CC cream | BB and CC creams are just perfect for the warmer seasons. Personally I wear them all year round, but it's especially nice for the spring time. This particular one has SPF 30 and gives the gorgeous illuminating effect - doesn't that sound very spring appropriate? Clinique Airbrushed concealer | In the spring time I don't like wearing too much makeup so it's all about the natural airbrushed look. And this concealer works just great for creating that effect and adding a little more brightness to the complexion. Urban Decay Naked Basics | As I said I like to wear as little makeup as possible - or at least make it look as natural as possible, therefore in the spring I even tend to ditch the cat eye! But to add a little bit more depth to the eyes I always use my Naked basics palette. Dior lip glow | As I talked about it before, this product is just awesome. It's basically a super soft lipbalm that makes the lips brighter and pinkier, it stays (or stains) for such a long time and you don't have to worry if it still looks good after hours, because it does. Dolce and Gabbana blush | It's a shade rosebud and it's just one of the prettiest blushes ever. It's not highly pigmented, it's matte, but somehow it makes the face look glowing, naturally flushed and airbrushed. It's just pure perfection and I mean look at that packaging?! Paul and Joe highlighter | Carrying on the airbrushed look, it's also important to use a highlighter. It just looks so pretty in the sunlight, doesn't it? I'm currently loving the Paul and Joe face color in Secret Dor. Elie Saab L'eau Couture perfume | I just talked about this fragrance a few days ago, but I had to include it in this post because it's the most perfect spring scent ever! I've been curious about the Dior lip gloss... It sounds wonderful!! I need to check out the Paul and Joe highlighter as well. I've been using Benefit's Watt's Up and haven't been that impressed. 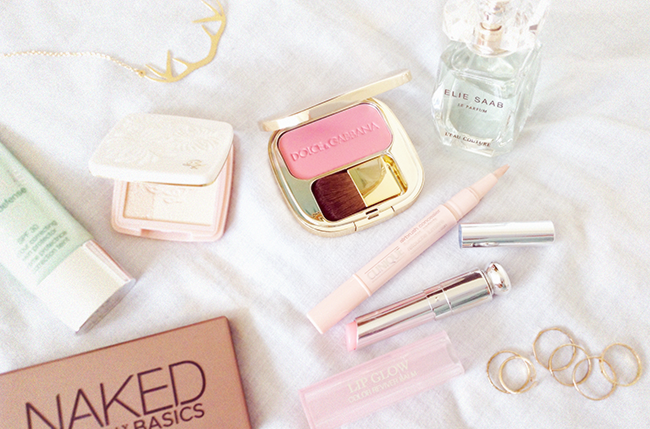 That pink blush looks amazing! You photos are so beautiful!! 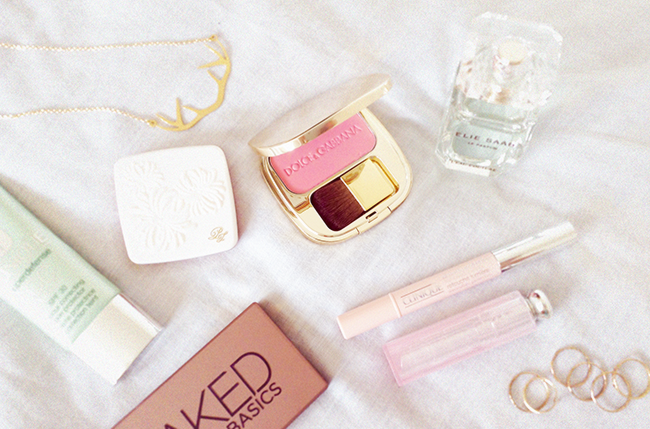 That blush shade is super pretty! Great must have's i really like the shades UD chose for the Basics palette! i love the perfume so much- it's wonderful! Love this selection of products! The Naked Basics palette is amazing! 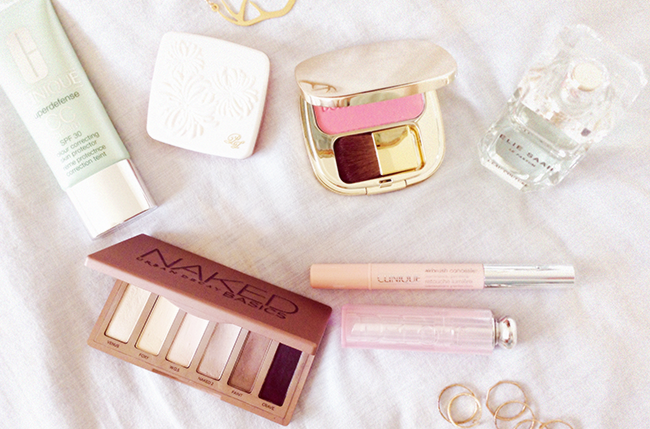 Pretty rose-colored products! Love the Naked Basics palette--Urban Decay is just amazing! Those rings will be perfect all throughout the summer! 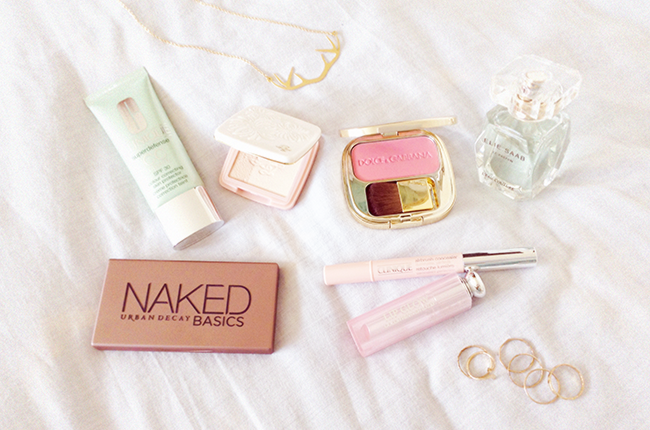 I love the Naked Basic palette, it's the perfect starter kit. such a pretty post! I love the way you arranged the stuff! Los colores suaves y pastel son perfectos para la primavera!! I love these photos! They just look so dainty and clean... perfect for spring! This looks like a great essencial kit! you have a great wishlist!! 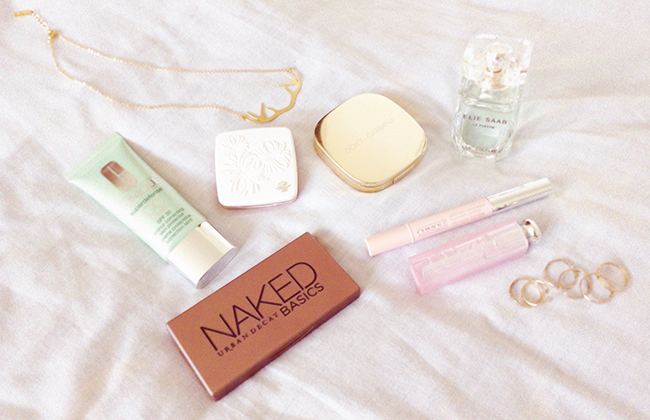 I love naked basic product and I love too if we can follow each other..
Love your blog, your photos are so adorable!